Here, then, is the thirteenth instalment of the story of how Mary Jones and Thomas Charles triggered a mission to the world. Mary, who (in 1806) was twenty-two, seems frequently to have attended preaching meetings beyond Cwrt and quarterly Methodist Association meetings. 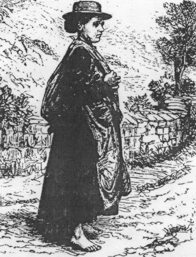 She went a number of times all the way to Associations meetings at Llangeitho (where Thomas Charles had been converted to Christ) and saw and experienced “great and mighty things” there. On such occasions she often saw Thomas Charles, and, as far as we can tell, both made a point of meeting and talking to one another. At the foot of Cadair Idris in February 1813, the sound of bells echoed across the water at the southwest corner of Tal-y-llyn lake as Mary Jones, now twenty-eight, married Thomas Jones. Everyone called the bridegroom Thomas Lewis, since Lewis was his father’s Christian name. He was a linsey and flannel weaver and throughout their married lives both Thomas and Mary worked as weavers. For the first seven years of their life together, the couple lived at Cwrt a few steps away from the chapel they both attended. Before the year ended, Mary had the first of their six children. They gave the first baby his father’s family name of Lewis and he lived until he was eighteen. We saw how, in 1800, old Richard Owen had prayed that Thomas Charles would have fifteen years added to his life. The end of this period was now drawing near. Charles had been ailing for three years and in the spring of 1814, in his fifty-ninth year, he grew worse. He edited and prepared for the press a new edition of the Welsh Bible which was published by Bible Society in the same year. “Now I have nothing to do but die,” he said. On Wednesday 5 October he woke shivering. “Well, Mr Charles, the day of tribulation has arrived,” a caller said to him – the sort of visitor you may feel he could have done without. “There is a refuge,” Charles replied. He died later in the day. He had set up a printing press in Bala. Between 1805 and 1811 he had issued his Bible Dictionary in Welsh in four volumes and this remains a standard work. He had edited a Christian quarterly magazine in Welsh. He had established day and Sunday Schools. He had toured Ireland for the Hibernian Bible Society. He was one of the makers of modern Wales. Most of all he will be remembered as the man who presented Mary Jones with three Bibles and whose energetic pleading in London on behalf of many like her led to the foundation of the British and Foreign Bible Society. In 1820, Mary Jones, her husband Lewis and their now two surviving children Lewis (aged 7) and Jacob (aged 2) moved down the valley to Bryncrug, a village a couple of miles from the sea. The cottage where they lived still stands, and when I was there in 2002, the owners were selling Mary Jones clocks made from the slate of the original roof which had recently been renovated. Mary second child, Mary, had been born in 1815 and had died when she was two. Her third child, Jacob, had been born in 1818 and lived until he was fifteen. In the year the family moved house, Mary’s fourth child, Ioan (John), was born. Her first child, Lewis, and her sixth and last, another Mary, died within days of each other in 1831. Jacob was still alive but died two years later. Ioan later emigrated to America and was the only one of the six children to outlive his parents. If he took the third Bible presented to his mother by Thomas Charles with him, he didn’t appear to read it much. Mary complained about the letters he wrote to her from across the ocean. “They have no religion in them,” she said. We are not sure when Ebenezer died but we know that he did not survive Mary. It may be that, as so often in the nineteenth century, tuberculosis was the cause of the early deaths of five of Mary’s children. You can read the next instalment of the Mary Jones story at this blog tomorrow.